Sponge Painting: Always a favorite with the kids, this time around cut out sponges in shapes inspired by the new season. Flowers, leaves, butterflies, trees are ideal choices. Then let your kids loose with plenty of washable paints and lots of paper. You could also choose stones and pebbles from your garden and paint them instead. Once your garden is in full bloom, you can use these same rocks and stones to decorate the garden too. 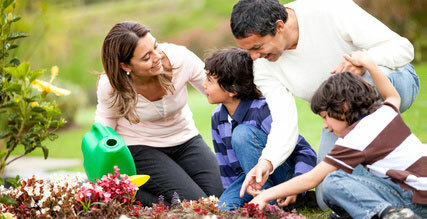 Start the Garden: Spring is the perfect time to start planning your garden in anticipation of the warmer months to come. Involve your children in the planning process. Let them help make lists of what seeds and bulbs to buy and to plot the garden on paper. As the weather improves, you could even go out and start preparing the soil for the planting. If your kids are insistent about growing something, place some lima beans in a wet towel and place them on a windowsill. The beans will soon sprout much to the delight of your kids. Bugs and Butterflies: Spring is the time when the bugs come out to play. Get your kids to grab a magnifying glass and try and identify all the bugs and butterflies they spot. Slightly older kids can take a camera and make a journal with the photos of bugs they see. Take it one step further and bring out the encyclopedia to help identify the bugs and learn more about them. Build a Bird House: Simply purchase a birdhouse from your local craft store and let your kids decorate it before hanging it on a tree. Place some bird feed on a plate and let your children spend hours watching the birds come and eat. Add a pair of binoculars to the mix and your kids will soon be budding birdwatchers. Measure the Rain: Spring also brings with it plenty of showers. The next time it rains place a measuring cup in an open area. Once it stops raining, the kids can go out and see how much it had rained. This will also introduce them to the concepts of weather and the climate. Besides these spring activities, make the most of the wonderful weather by indulging in your favorite outdoor pastimes such as taking bicycle rides or long walks with your kids, flying a kite or planning a picnic.